You know what I could really go for right now? A stale melted Jolly Rancher sandwich. How about you guys? The Pop-Tarts people have caught Oreo fever as of late, teaming up with everything from Dunkin’ Donuts to A&W Root Beer in an attempt to up the profile of everybody’s favorite toaster-friendly breakfast rectangle. Though while many of these joint operations involved creating brand-new flavors, Pop-Tarts’ team-up with Jolly Rancher candy results in twisted versions of three already existing Pop-Tart varieties. There are already cherry, watermelon and apple Pop-Tarts. Yeah, the apple is normally paired with the words “strudel” or “cinnamon” or “Dutch”, but it’s still apple. We’ve been there. Jolly Rancher Pop-Tarts are not simply re-branded versions of these existing favorites. The original Pop-Tarts seek to reproduce actual fruit flavors. 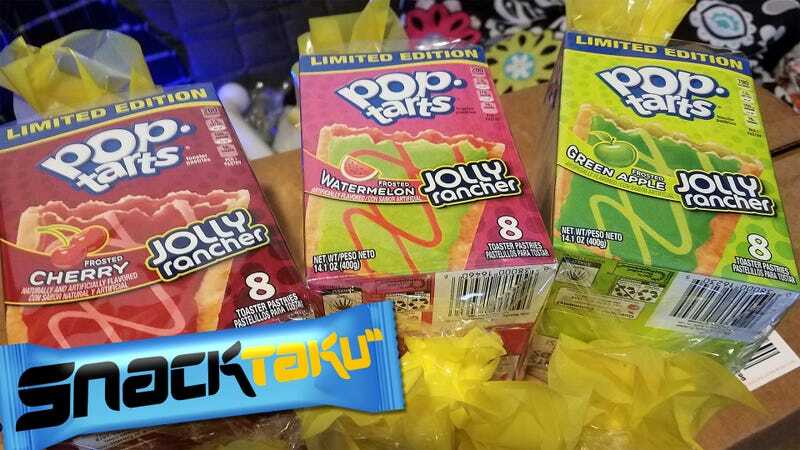 Jolly Rancher Pop-Tarts are trying to replicate the unique flavors of a popular brand of fruit candy. Well, they succeeded. I’m not sure that’s a good thing. Let’s take a look. Dipped in blood-colored frosting to seal the dark bargain between candy maker and breakfast treat peddlers, the Frosted Cherry Jolly Rancher Pop-Tart is the easiest example of the branded transformation. Everyone’s had a cherry Pop-Tart. They’re sweet, they’re red, they’re simple. Jolly Rancher cherry Pop-Tarts are not simple at all. The filling emulates the candy perfectly, with a tartness and sharp tang that’s never graced the inside of a Pop-Tart shell before. Yes, it tastes like Jolly Rancher candy, but it works better as a sick joke played on someone who appreciates the original cherry Pop-Tart. The Watermelon Jolly Rancher Pop-Tarts take the flavor transformation in the opposite direction. Real watermelon Pop-Tarts are cloyingly sweet affairs. The Jolly Rancher variety is much more subdued. The candy tang is still present, but not in the mouth-shrinking levels found in the cherry variety. If it were dialed down just a tiny bit more, we’d have the perfect watermelon Pop-Tart on our hands. Jolly Rancher apple is so removed from actual apple flavor they should call it something else. There’s an acidity to the candy that tickles the back of the throat and opens nasal passages. If that sounds like something you’d like inside a Pop-Tart, well then you are in luck! Where regular apple Pop-Tarts bring to mind warm apple pie, Jolly Rancher Apple Pop-Tarts take me back to getting my gums sliced by a sliver of hard candy I’d sucked down to razor-sharpness. They are just that pleasant. I love Pop-Tarts. There are few things in the world as comforting as knowing there’s a full box of frosted strawberry in the cupboard. There is comfort in that boxy shape, and there is no other rectangle I’d rather put in my mouth more. Jolly Rancher Pop-Tarts do not give me that same vibe. Replacing those sweet, fairly-accurate fruit flavors with their candy equivalent feels like a betrayal. Special thanks to the Pop-Tarts folks for sending these along!